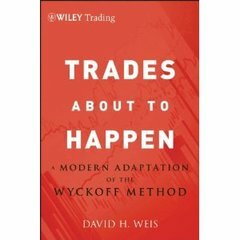 Daivd H. Weis, who is a Wyckoff professional trader, wrote a book "Trades About to Happen: A Modern Adaptation of the Wyckoff Method" that I'm looking for in pdf format. If you have it, please share. Thanks. Is anybody in the position to arrange a "usable" pdf file from this link ? On Amazon it says "This title has not yet been released." & "Publication Date: June 4, 2013". Looks like it's a "book about to happen". This is an example that it's always good to read the fine print. has this book ever been uploaded before? i have it on kindle. but my opinion.. not worth to buy or read.